The most dangerous internal destabilizing factor for the Atlantic Alliance within its current strategic assets is the persisting influence, on a relevant portion of Western Europe’s public opinion, of anti-American prejudices due to decades of political propagandas spread by both the right and the left wing. Analyses about the generation and structure of similar prejudices have always confirmed that, in truth, they are not based on facts, but on ideological hostility (of nationalistic, neo-Fascist, Communist, pro-EU nationalist nature) along with the distortion and removal of the memory of effective historical facts, two of which have fundamental importance. The first historical fact of fundamental importance that anti-American Europeans have “forgotten” is that without the intervention, the effort, the military and economic sacrifice of the United States from 1941 to 1991, Europe would have never been able to stand free from the shackles of Fascism and National-socialism, as well as of Soviet communism. Part of this free Europe is also the present-day Free Territory of Trieste, which the 1947 Treaty of Peace with Italy established as independent sovereign State, entrusting its provisional Regime of Government to the United States and to the United Kingdom, together. The second “forgotten” fundamental historical fact is that the economic and social rebirth of Western Europe after World War II was possible thanks to the economic and political aid of the United States, which started as early as in 1945. From 1948, this aid was consolidated in the European Recovery Program – ERP, the well-known Marshall Plan, and also with the first political-economic European organizations: the OEEC – Organisation for European Economic Cooperation, and the EPU – European Payments Union. Among the 18 receiving States involved in the ERP, in the OEEC, and in the EPU, there is also the present-day Free Territory of Trieste, which owes to the aid provided by the United States a decisive part of its economic and social development, especially during the direct exercise of the British-US special trusteeship mandate. In 1797 the free port of Trieste, the “Philadelphia of Europe” and flourishing maritime capital of the Austrian Empire (LINK) became, after Paris, the second European city to host a diplomatic seat of the United States, with which it established vivid cultural, human, and economic ties through the transatlantic routes sailed by the ships of the Lloyd Austriaco (then Lloyd Triestino) and of the Austro-Americana & Cosulich lines. In 1945-47, after World War II, the contribution of the United States proved decisive to establish the Free Territory of Trieste as new independent European State provided with the only international Free Port in the word, and placed under the direct protection of the United Nations Security Council. Since 1947, the provisional regime of the present-day Free Territory of Trieste is entrusted, on behalf of the UN Security Council, to the primary responsibility of the Governments of the United States of America and of the United Kingdom of Great Britain and Northern Ireland, which, in 1954, have sub-entrusted its civil administration to the Italian Government, and its military defense to NATO. 2018 marks the 70th anniversary of the Marshall Plan, one of the events in which Trieste has the moral duty to thank the United States for its decisive contribution to the establishment, development, and to the future of the present-day Free Territory of Trieste and of its international Free Port. The European Recovery Program – ERP, officially announced by President Harry S. Truman on 3 April 1948, is also known as Marshall Plan after its promotor, General and Secretary of State George C. Marshall (LINK), awarded with the Nobel Peace Prize in 1953. On 5 June 1947, with an official address at Harvard University, General Marshall invited all European Countries devastated by the war, both the winners and the defeated, to agree upon an economic program for European reconstruction together with the United States, which would fund it. The offer did also regard the Soviet Union, Poland, Czechoslovakia, and other eastern European Countries that had already received significant economic support from the United States between 1945 and 1947. The aid program’s origins were, before political-economic and strategic reasons, the strong ethical reasons consolidated in the establishing principles of the United States of America, as well as the emotional involvement of its citizens with close ties to Europe. After early contacts, the Soviet Union and the Countries under its influence renounced to join the initiative, yet, within the same year, the initiative was joined by 18 European States, including Turkey and the present-day Free Territory of Trieste (LINK), established on 15 September 1947 and represented by its first British-US provisional Government. The Congress approved the economic assistance plan on 2 April 1948, and President Truman announced it officially the following day. 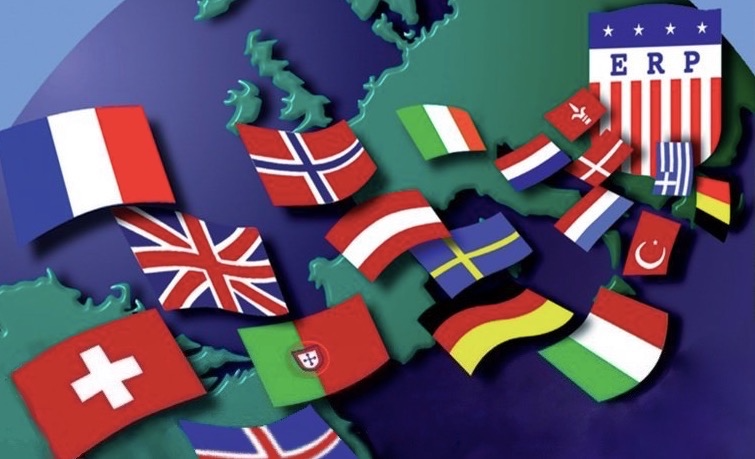 On 16 April the recipient Countries undersigned the agreements establishing the Organisation for European Economic Cooperation – OEEC (now OECD), while the present-day Free Territory of Trieste and Western Germany joined on 16 October of the same year (LINK). From 1948 to 1953, the United States spent more then $13 billions of public money (about $32 each year for each US citizen) to finance the Marshall Plan’s aid to Western Europe and Turkey: 86% was used to provide free goods and service (grants) while the remaining 14% consisted in loans granted under highly convenient terms. The Government of each receiving European State was bound to deposited on a counterpart fund, in own currency, the value of the goods it received for free by the United States, the fund would be used to promote recovery and development in each Country. Instead, the loans were granted in US Dollar, were to be repaid in annual instalments with a 2.5% interest rate and the repayment period, which started from the second semester of 1956, thus after the E.R.P. had ended, was of 35 years. Also, the contract with each receiving State included a waiver clause that, under exceptions circumstances, allowed to defer the payment. The United States managed the Marshall Plan through the Economic Cooperation Administration – E.C.A., which was in charge of providing both the grants, thanks to the funds it received from the Congress, and the loans, through the Washington Import-Export Bank, as agency of the US Government. The list of the recipient States includes Austria, Belgium, Denmark, France, Germany (Western), Greece, Iceland, Ireland, Italy, Luxembourg, the Netherlands, Norway, Portugal, Sweden, Switzerland, Trieste, Turkey, the United Kingdom. Trieste did also have a strategic role as port for the transportation of US aid and military supplies, especially to Austria and to south-western Germany (LINK). In 1950 E.C.A. aid was extended also to Yugoslavia, which had left the Soviet bloc in 1948 and was getting close to the West. Yugoslavia would receive economic and military support from the United States also in the following decades, as well as being included in the NATO defense area with the Treaties of Friendship and Collaboration Between Yugoslavia, Greece, and Turkey signed in 1953 and in 1954. Until 1954, the United States have sent 44 million USD of the time to the present-day Free Territory of Trieste through the Marshall Plan and E.R.P. aid; it is almost five times more than the aid granted to bordering Italy per capita. This aid was used by the first British-US administering Government of the present-day Free Territory of Trieste correctly and efficiently to create jobs and welfare developing the international free port, industries, trades, and social care. However, later economic aid that the United States sent to the Free Territory of Trieste was managed by the temporary civil administration sub-entrusted to the responsibility of the Italian Government, the misconducts of which are still to be remediated. Since 1797 generations of Triestines living in the US and of Americans living in Trieste are strengthening the cultural, economic and, since 1947, juridical historical ties between Trieste and the United States of America. The value of this bond is even greater because the present-day Free Territory of Trieste, with its international Free Port, is now an essential logistic instrument for the strategic consolidation of the Countries of Mitteleuropa between the Baltic, the Adriatic, and the Black Sea (LINK).